As I’ve detailed before, the world of handing over “press cars” to journalists and important people has mores but not many rules. One of the most basic rules, unless specified otherwise, is that you review the car. In spite of this, many autojournalists have cars they’ve driven that didn’t get reviewed. I have a lot, so I’m fixing that so it’s not on my conscience when a next owner takes over the company. Some of my excuses for not reviewing these cars are real and legitimate, like through no fault of my own two cars were double-booked and I didn’t get enough time to drive both of them. In a few cases I made it clear we’d already written a review and I was just curious. On other occasions, through disorganization, we booked the same car across multiple writers. Often, though, I just forgot to get pictures or let too much time lapse between driving the car and writing it up and then entirely forgot about it. You’ll see most of them grouped in the time of period where I started running the site and thus didn’t focus as much on writing. So, here we go, what I can remember about the 29 cars I drove and didn’t review (that I have proof I drove). What I Remember: Oh man, this little car was great. It had the beautiful Verde Azzuro paint that made it look like a deep, shimmering South American lake. Plus it came with a five-speed and is essentially the European Abarth (our Abarth is/was the European Abarth SS). I had a ton of fun with this car and, while you’re probably just going to get the Abarth, the non-Abarth car is a little bit of a sleeper. What I Remember: I had a lot of fun tearing through the backwoods of Virginia in this car and I think I tested it right before I moved which is why it never got written up. It was serious fun and, while it wasn’t an M3, the bright blue paint made it a lot more interesting than many BMWs. I do remember cooking it way too hard on a mountain road and nearly putting some of that paint on a guardrail. What I Remember: Almost nothing, honestly. I guess my excuse for not reviewing it as that, deep down, I knew that the car was selling a lie. What I Remember: This is funny. I was helping out with a mayoral campaign in Houston and the nutty professor of a candidate had to quickly get to the dentist in between events and I dropped the hammer on the “sport package” equipped Maxima. It was faster than I’d have guessed and I think I freaked the candidate out a little because after that he suddenly stopped asking me to drive him places. I kind of still like that car. Not a lot of torque but quicker than you’d think and FWD has its advantages. Anyway, that was not this car. There was also another Maxima I got and also didn’t write about. What I Remember: This was another great car. Low and load and fast and a little archaic. I feel like I did review it and I definitely remember taking pictures with Zerin Dube, but I can find no proof of this. What I Remember: Cayennes are great and I’ve reviewed them before. I think I also had a Porsche 911 around the same time and it just blocked out any memory I had of the Cayenne. I remember my wife loved it and I felt bad that I’d probably never be able to afford a new one for her. What I Remember: Jack Baruth will always have the upper hand having owned this car so I’ll just agree with his statement that they’re more fun than you’d imagine and rock solid. This did launch a fun conversation in Oppo with Honda PR though, so I think it counts as a review. What I Remember: Do we really need to write more about Mazdas? Is that what someone is clamoring for? 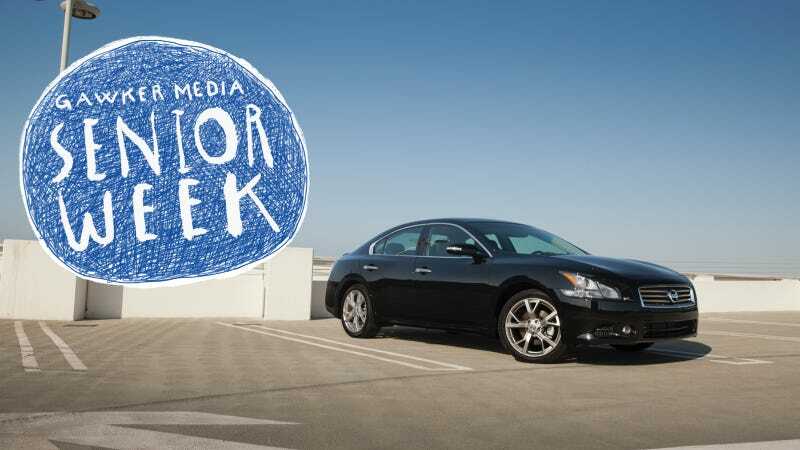 Yet another Jalopnik Mazda take? What I Remember: I had a Nismo Juke not that long after and I remember liking both. What I Remember: I don’t think I ever got this car. I don’t have any photos or any proof other than a window sticker sitting on my desk. What I Remember: A big hint for me in these is the color and the color of this car is “Audi Exclusive Color.” I think it was brown. What I Remember: Mostly being sad. Mitsubishi is the company I’m most sad about not surviving, although I’ve been informed it still sort of exists? Here’s hoping Nissan does right by them because they used to be good and they should be good. What I Remember: The Genesis is a lot of car for the money and also something I could absolutely see a different version of myself that has like 10% less fun and 60% more common sense owning. The Equus is way more car than that. If you were willing to spend upwards of $60,000 on a Hyundai you’d get something about as big as an S-Class with almost all of the weird massaging features and sunshades and even a refrigerator in the backseat. The only downside is it’ll be an Equus. What I Remember: This is another car I have no memory of, but I told my parents to buy a Kia Soul and they liked it so I must have liked it. What I Remember: This must be some kind of joke. I never had a Yaris. What I Remember: The Scion was another car actually much faster than you’d imagine, with a reasonable 180 HP out of what the window sticker calls a “2.5L V4.” I didn’t realize they were still making V4 engines since the Ford Taunus but there you go. I like the tC and I hope it ends up somewhere in the new Toyota Universe. What I Remember: $50,000 is too much for this car, but if money is no option it’s still probably the best version of a small crossover you can get. What I Remember: I forgot this car existed, but someone mentioned it to me when I was looking for a new car and I considered it. What I Remember: Every time I see crumbs in my new car left from some baby crap I remember that this Honda had a vacuum cleaner in the back and I laughed at it at the time and I was wrong. If you can roll with a minivan and you need a minivan get a minivan. Minivans are great. I’m the one that’s not great. What I Remember: We drove this thing to one of our video shoots and it was a nice little SUV. For about 95 percent of the planet, the X3 is all the car you’d ever need. What I Remember: To be fair, before we ran out of money, there was a time when we were going to do a Buyers Guide for every car and I volunteered to drive some things less interesting to the average writer. The Murano was nice. Get a Nissan. It’ll be fine. What I Remember: Jesus, have I ever reviewed a Maxima? What I Remember: This is a cute car. Do you need a cute car? Buy an A3 Cabriolet. What I Remember: I was going to review this car but Raphael fell in love with the thing so he did. What I Remember: I probably did Honda a favor not reviewing this. Just pretend like no Civic existed in between like 2003-2015 and you can pretend the Civic is still the most consistently good car ever built. What I Remember: Actually did a long road trip with a family of three and my wife and this. We were all comfortable. It was a pleasing drive out to the mountains near West Virginia. This car gives me good feels. What I Remember: People think the Optima is a lot more expensive than it is. Good for Kia. What I Remember: The top of the window sticker says “Choose to be Inspired” and I guess I chose not to be inspired. What I Remember: I wanted a manual. What I Remember: It had a manual and it made me happy and no one else. That’s certainly not even all of them, but those are the ones I have proof I’ve driven. Well, I feel better. Also, I’m fired. I just fired myself. Do You Have Any Idea How Much It Pisses Me Off That The Panama Supercar Replica Scam Is Still Around?